The main thing is Jesus Christ and His gospel. "For our sake" simply put means that for our own well being. "He made Him to be sin who knew no sin." As Christ was on the cross, the sins of the whole world was laid on Jesus. Romans tells us that God put Jesus "forward as a propitiation by his blood, to be received by faith. This was to show God's righteousness, because in his divine forbearance he had passed over former sins. It was to show his righteousness at the present time, so that he might be just and the justifier of the one who has faith in Jesus" (Romans 3:25-26). Jesus appeased God's wrath so that will not have to. Those who come to faith in Christ are sons and daughters of the Most High God. Jesus knew no sin yet He took our sin upon Himself. The final phrase of that verse, "so that in him we might become the righteousness of God" means that we become righteous in God's sight. Whenever God looks at us, He sees the perfect righteousness of Christ. Being justified means that God looks upon us just as if we never sinned because we have the righteousness of Christ. So, why do we speak of the Friday when Jesus was brutalized and crucified as good? It would almost seem as if there could hardly be a day that is worse! In one sense, you are correct. Jesus was unjustly tried, lied about, scourged, and sadistically crucified. But in a far more ultimate sense this was immeasurably good. It was good for two reasons. First, the crucifixion of Jesus, as horrible and unjust as it was, fulfilled God’s plan. Peter declared this in Acts 4:27-28 by reminding us that, in crucifying Jesus, “Herod and Pontius Pilate, along with the Gentiles and the peoples of Israel” were doing “whatever your hand [God’s hand!] and your plan [God’s plan!] had predestined to take place.” This was no accident of history but the eternally predestined purpose of God. The second reason that such a horrible incident can be regarded as “good” is because by means of this event, and only by this event, are we able to be forgiven of our sins and reconciled to God. Peter tells us that “Christ also suffered once for sins, the righteous for the unrighteous, that he might bring us to God” (1 Peter 3:18). Notice three things that make the gospel the very best news there is. First, when Jesus suffered, he suffered for our “sins.” Christ died because of or for our “sins” in the capacity of one who took the penalty for them upon himself. It is only because Jesus has died for our sins that we don’t have to. Second, when Jesus suffered for our sins he suffered only “once” and for all time. There is no need for him to suffer again or for another sacrifice to be made. His once-for-all time atonement was perfect and sufficient. Fourth and finally, Jesus suffered for our sins to “bring us to God.” That is the greatest of the good news, that because Jesus died for us, we get God! Ask Pastor John: Where Was the Holy Spirit on Good Friday? Do You Have a Possessing Faith? The Bible clearly indicates that it is possible for people to make a profession of faith and unite themselves to a congregation while not actually having a possessing of faith they profess. Christ spoke of the facility by which people can honor Him with their lips while their hearts are far removed from Him (Mark 7:6). He warned in the Sermon on the Mount that on the last day people will say, "Lord, Lord" whom He will dismiss from His presence with the dreadful words, "I never knew you; depart from Me" (Matt. 7:23). In like manner James expounded the problem of those who declare they have faith but whose faith is moribund, yielding no fruit and displaying no works consistent with genuine saving faith (James 2:20). The second coming of Jesus Christ will be for the purpose of judging the world and perfecting the salvation of His people. Men and angels, the living and the dead, will appear before Him to be judged according to the record which was kept of them, Matthew 24:30, 31; 25:31, 32. It will be a coming with terrible judgments upon the wicked, but also with blessings of eternal glory for the saints, Matthew 25:33-46. While He will sentence the wicked to everlasting punishment, He will publicly justify His own and lead them into the perfect joy of His eternal Kingdom. This will signalize the completed victory of Jesus Christ. If anyone knew how to be content, it was the Apostle Paul, who has been beaten, left for dead, shipwrecked, and under house arrest, which was the case as he wrote to the Philippian church. Contentment is basically accepting what God has given us in the season of life we are in. Perhaps, it is facing financial difficulties or a terrible disease. Maybe it is a rebellious child or a church on the verse of collapse. The Bible teaches that God gives us what we need for life and godliness (2 Peter 1:3), therefore, we should be content with what we have and what were given, which is easier said than done. Davis continues with how Christ taught us contentment which was through His life and ministry. One area Davis addressed was Christ's atonement. Christ paid the way for sinners to come to God. In this world, we are looking for ways to get to God and all of them do not include Christ. Jesus is the one Way to get to the Father and we have to be content with that knowing God has given us the way for us to be right with Him. 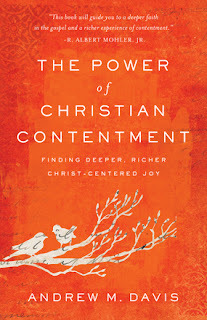 Finally, Davis addresses the practical ways Christians can get contentment. The first thing is to have new life in Christ. For us to be content, Jesus needs to be the first priority of our life. We need to be in the Word. The Bible teaches us contentment such as the verses we have already mentioned. Prayer is another where we ask God to help us be content. We need to practice not complaining, which I will confess is a tough one for me. God has given us what we need in this life and we should be grateful while not complaining about whatever is happening in this season of life. Contentment is not an easy issue to address and I wish it was easier said than done. With our selfie filled world, we can grow discontent in a second. With access to our bank accounts faster than what the previous generation had, we can become very bitter. I am delighted that Davis wrote a book for such a time as this because we need to be reminded of the importance of contentment in this life. Thanks Baker Books for letting me review this book. If you are like me and other theology nerds, you love getting and reading new books. The challenge is always how much room do I need for a new shelf or can I store them somewhere so that we do not look like hoarders. I know there are many books I have enjoyed over the years that I have even had the opportunity to read some again. Of course, it might be difficult if you have underlined or highlighted the book that you want to read only those parts. and to know the love of Christ that surpasses knowledge, that you may be filled with all the fullness of God (Ephesians 3:19). The love of Christ in its sweetness, its fullness, its greatness, its faithfulness passes all human comprehension. Where can we find the words to describe His matchless, His unparalleled love toward the children of men? It is so vast and boundless that, as the swallow simply skims the water without diving into its depths, so all descriptive words merely touch the surface, while immeasurable depths lie below. Well might the poet say, O love, thou fathomless abyss! For this love of Christ is indeed measureless and fathomless; no one can fully comprehend it. Before we can have any right idea of the love of Jesus, we must understand His previous glory in its height of majesty, and His incarnation upon the earth in all its depths of shame. But who can tell us the majesty of Christ? When He was enthroned in the highest heavens He was very God of very God. By Him the heavens were made, and all its inhabitants. His own almighty arm upheld the spheres; the praises of cherubim and seraphim perpetually surrounded Him; the full chorus of the hallelujahs of the universe flowed without ceasing to the foot of his throne. He reigned supreme above all His creatures, God over all, blessed forever. Who can tell His height of glory then? And who, on the other hand, can tell how low He descended? To be a man was something; to be a man of sorrows was far more. To bleed and die and suffer—these were much for Him who was the Son of God; but to suffer such unparalleled agony—to endure a death of shame and desertion by His Father—this is a depth of condescending love that the most inspired mind must utterly fail to fathom. Herein is love! And truly it is love that “surpasses knowledge.”O let this love fill our hearts with adoring gratitude and lead us to practical demonstrations of its power. So then you are no longer strangers and aliens, but you are fellow citizens with the saints and members of the household of God, built on the foundation of the apostles and prophets, Christ Jesus himself being the cornerstone, in whom the whole structure, being joined together, grows into a holy temple in the Lord. In him you also are being built together into a dwelling place for God by the Spirit (Ephesians 2:19–22). Paul mentions three metaphors for the church: God’s people (fellow citizens), God’s household, and God’s temple. The first two metaphors are important to communicate the relational security that we have, with increasing intimacy. We learn first that we have a place in the kingdom, and then we learn that we have a place at the King’s table. These metaphors are of particular significance when we remember that those gathering in the Ephesian church were of different backgrounds and ethnicities. The work of the gospel not only breaks down barriers but unites hearts in profound ways. The third metaphor is particularly rich in theological significance. The temple in the Old Testament was the physical representation of the divine manifestation. The sacrifices, the rituals, the festivals—these all took place at the temple because God dwelt there. God lived among his people and met with them through the temple to indicate his care and their preciousness to him. In the age of the new covenant we are the Holy Spirit’s home and the temple of God (vv. 20–22; cf. 2 Cor. 6:16; 1 Pet. 2:5), to indicate his care for us wherever we are and to indicate our preciousness to him whatever our situation. Temple imagery stretches from Genesis to Revelation—from Eden (the first place of God’s presence) to the tabernacle (the portable temple) to Solomon’s temple (designed to resemble a garden paradise) to Ezekiel’s temple, to Jesus Christ the incarnated Son of God who “tabernacled” among us (John 1:14). The cubic dimensions of the new Jerusalem suggest that heaven is our final temple (Rev. 21:16). What an indescribable privilege that we who have the Spirit of Christ should be counted as the temple of God. Living in light of this privilege leads to joy, gratitude, confidence, and holy living as God’s holy people.